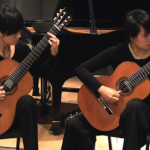 Beijing Guitar Duo playing Domenico Scarlatti’s (1685–1757) Sonata K.141. I’m always impressed with the ultra clean and crisp playing of the Beijing Duo with Meng Su & Yameng Wang. They are particularly suited to this as the original was for keyboard (harpsichord) and they keep the rhythm and clarity of the musical figures. This is live from a concert in Qingdao, China (July 2014). Seems to have started very fast and lost some tension by the end. Whats your take on that? Wonderful machine gun fingers but the trills were unworkable at that tempo I thought. All the right notes, somewhat. It wasn’t played with much soul, at least to my ears. I think if they played this slower, they would have been able to play with feeling. This simply sounds like a lot of notes to me.